My wife is the Mid-East Regional director of Clan Davidson Society USA. We are always looking for something to attract visitors to our tent plus be educational. 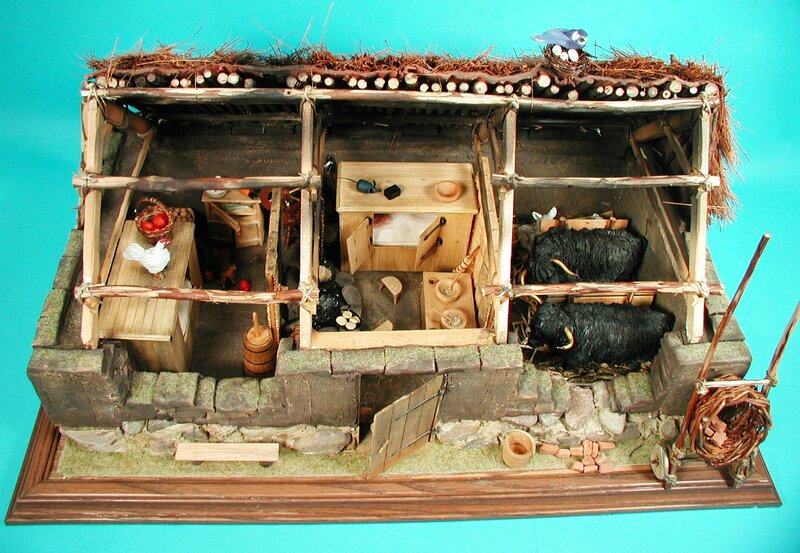 One of the things we came up with was a model of a typical highland farm. To build this farmhouse first required a lot of research. So on our last trip to the highlands in May 2002 we went with the purpose of collecting information on building a model farm and a scale replica of our Clan castle Tulloch. Very fortunately for Clan Davidson our family home was originally in the Invernahaven area of Scotland. The reason this is fortunate is there is an excellent reconstruction of a typical farm community in the Kinguisse area, which dates very close to when Clan Davidson was still living in this area. 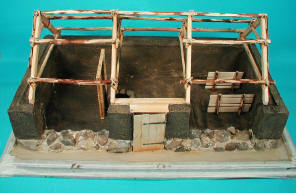 The reconstructed village at the Highland Folk Museum at Newtonmore is based on the village of Baile Gean which is located close by and is an archeological dig site. We visited the museum and talked but mostly listened to the outstanding staff of the village. They dress in the period cloths and present an outstanding narrative of what living back in the 1600s was like in this area. There are actually two related but different Highland Folk museums there. One is in the town of Kingussie where mostly old farm equipment and furniture is located plus a very interesting "Lewis Black House" from the Isle of Lewis. Further south in Newtonmore is the second part of the museum, which includes a number of small villages with examples of farms from the recent past back to the village of Baile Gean, which we based our model on. We also visited the Croft Museum on the Isle of Skye for further research but this is base on turn of the last century croft which while very interesting was not terribly helpful. It was interesting to note the strong similarities of both construction between all the family homes from across the centuries. In addition to the verbal information we picked up there is also an excellent book Highland Folk Ways by I.F. Grant. Dr. Grant founder of the Highland Folk museum and was considered an expert on the subject. Her book is very interesting and can be found at most book dealers at Highland Games. The purpose of building the house was to place it in our tent at the regional highland games we attend representing Clan Davidson. Although based on Invernahaven area of Scotland where our clan came from we have found that it draws interest from all tent visitors and of all ages. To build it I had to consider several things that would drive not only the size but also construction materials because the model would be traveling a lot and had to be small enough to fit on a table. 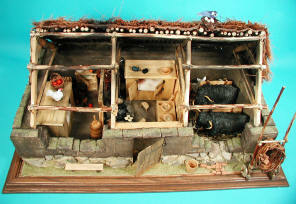 The true determination of the scale was actually directly related to the size of the miniature highland coos. I found some perfect porcelain coos in Scotland while on our trip which was surprisingly harder to do than I thought. Most miniature highland coos are for kids and therefore not very realistic looking. This scale fortunately worked out to 1" = 1’ scale which is a common scale for most dollhouses. Originally I had hoped to use standard dollhouse furniture but soon found virtually nothing available except for a few small items. Now for the construction. I made a rough floor plan drawing using the coos as my guide for their pens. I did condense the length of the house a little to make it smaller and easier to transport. I then bought a wooden picture frame, which gave me enough border for the base. I cut out a piece of ¼" plywood and glued it into the frame. Plywood is good for this type of construction since it does not warp. I used standard wood glue for almost all the construction. I was determined to copy the original construction techniques as much as was practical so I started by building the frame for the house. The base of the frame is a series of four "A" frames made from logs. 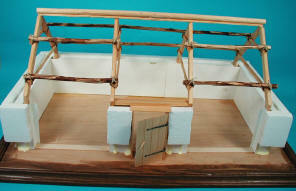 I used basswood for most of my construction including the four frames. After roughing them up I tied them together using string to represent rope. I then connected the frames using pieces of basswood strips, which I glued the frames to. The completed frame was then glued to the base. I then made connecting pieces for the roof out of small dead tree branches, which I had collected and stripped off some of the bark. They were first glued on then later more string was used to bind them. I built the door next making it out of thin strips of basswood. I did use some hinges I bought at a doll store but I scratch built the working door latch based on the real one. A frame was constructed and the door was then mounted. For the sake of weight I then used sheet styrofoam to fill in the walls. I did leave the fronts open to allow a view of the construction method and to make it easier to see into the house when it was completed. The styrofoam I used is found a most hobby train stores and is used for making train layouts. I also left the lower portion open to leave room for the foundation. The foundation was then added by gluing small rocks we had picked up in Invernahaven at the site of the famous battle the Clan Davidson took part in 1370 or 1386. I told you I wanted this as authentic as possible. I used a white plaster to make a mortar for the rocks. I had planned to have the fire and a couple of small lamps light up the farm so I added the electrical wiring now. Again the good old doll store came through. I also found a small rechargeable 12-volt battery to power the lights with. The sides of the base were covered in masking tape before the next step to protect the wood finish. The walls were then covered with plaster-impregnated cheesecloth to produced solid looking walls and give the paint something to stick to. I also built up the floor to leave a shallow trough in front of the livestock pens where the "waste" from the house would run off. The interior was then painted using water based paints. A fireplace was built also using more of the "authentic" Scottish rocks. 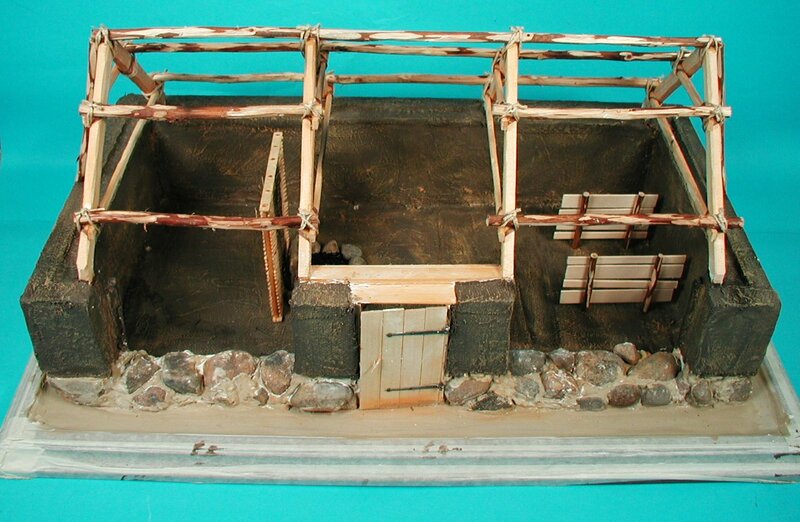 The partitions were often made from wicker so we made two walls out of thin straw. These were then glued in along with some small partitions for the livestock. After sitting back and looking at the house I decided it still did not convey the exposed construction look I wanted so I made slabs out of clay to represent the sod layers and laid them around the front and top of the walls. After this I repainted using more acrylic paints but used washes rather than solid layers to simulate the sod. The final step for the walls was to coat them with thin glue and sprinkle model railroad grass on them. I added a flickering fire for the fireplace and made two small lamps using grain-of-wheat lights. These were connected to the wiring before the roof was installed. The roof was then made first out of more sticks from the backyard to represent the logs normally used. This was covered with a layer of clay representing sod. I then covered the roof with broom weed. This was also purchased at the dollhouse store. To finish the model up I sprayed using an airbrush inside the house with a thin black paint to represent the soot that always filled these houses because of the peat fires. 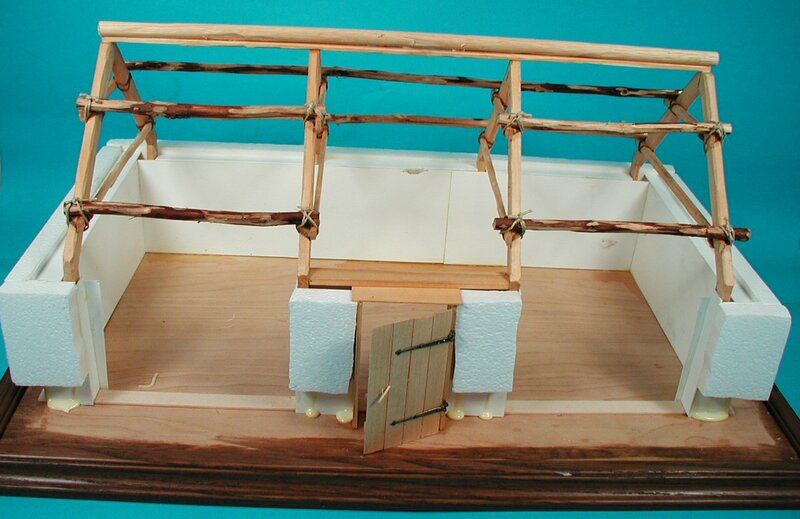 The furniture was all scratch built using basswood. This included the two box beds and stools plus a couple of other items. The mattresses for the beds were made from linen and filled with straw just like the real thing. The rest of the furniture was made from similar materials. I also found a number of items in a local arts and craft store in the small items section such as eggs, carrots and other items to decorate the house with. The pot over the fire was filled with a gruel made from 5-minute epoxy mixed with some appropriate gray and brown paints. The coos, which are normally brown now, had to be repainted since the cattle were not only much smaller than current highland coos but were usually black. I added some sheep and chickens for variety and give the children things they could identify. We took the model to several games and had great success but one thing I quickly decided was it needed some protection for little fingers. I purchased a special case made from plexiglas and things have been much easier on the nerves. Now the children can point and touch all they want.